What price betrayal? The bloody saga of revolution and republicanism reaches its climax in the final instalment of the Tom Neave trilogy. 1659. Tom Neave, now Lord Stonehouse and feared spymaster for the republic, must do what he can to maintain the reins of power. 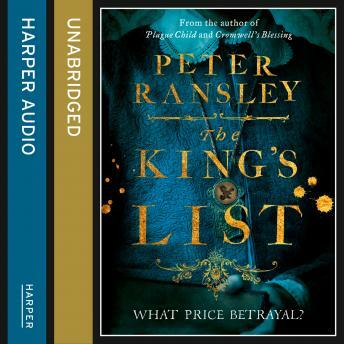 With Oliver Cromwell dead, a ruthless struggle for control of the country begins. A Royalist rebellion is easily put down, but is of concern for Tom - his son Luke is among those imprisoned. Having been freed by his father and back with his family, Luke claims he is disillusioned with the Royalist cause. But can Tom trust him? Pre-occupied by his son's uncertain allegiance, by the distant, manipulative behaviour of his beloved wife Anne, and by rumours of his treacherous father Richard, Tom is ill at ease. His own long-buried secrets threaten to erupt, with irrevocable consequences. As the struggle for power in England becomes more urgent, rumours abound of the return of the exiled king. Copies of the 'King's List' are in circulation - the names of those who signed the death warrant of the late king, of which Tom is one. While an army marches on London, the fate of the nation - and that of Tom and his family - lies at stake.